The work of Founders Ministries goes on due to the faithful men and women who commit to serving with us as Ministry Partners. 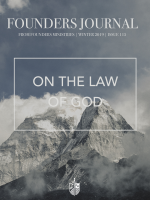 When you become a Founders Alliance Member, you invest in the ministry of Founders. We are then strengthened to pursue the work of upholding the gospel and renewing local churches. Through your sacrificial gifts, you provide believers with biblically grounded teaching focused on the glory of our sovereign God in the salvation of sinners through his Son Jesus Christ.